While Pit Bulls, including blue & red nose pits, are fairly healthy overall, like all dogs they are more prone to certain health problems. Today, we’re going to learn about symptoms & preventive measures for common pit bull health conditions. 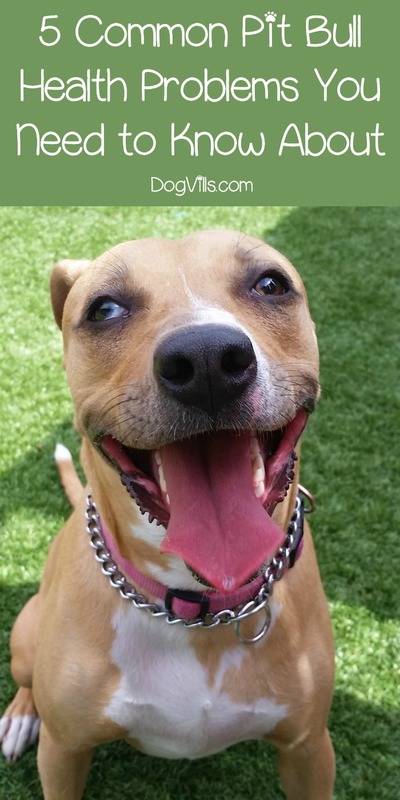 Whether you’re thinking of adopting one of these sweet “nanny dogs” or already brought one home and want to know what to watch for, these tips will help you catch these common pitbull illnesses & diseases early so your pup can live a long & happy life with you! If you have a dog (of any breed), then you’ve most likely have heard the medical term “hip dysplasia.” This is one of the most common skeletal diseases seen in the canine species and is characterized by a malformation of the ball and socket of the hip joint. Hip dysplasia usually begins when the dog is still young and physically immature. Dogs (like the Pit Bull) that are prone to this condition should have an x-ray done at two years-of-age (if they are going to be bred) to ensure they do not have any hip issues. If your Pittie does develop hip dysplasia, weight control and surgery may be required. The Pit Bull is prone to heart disease. This includes congenital heart disease (born with it) in the form of aortic stenosis, which is a narrowing of the left ventricle and the aorta. This breed can also have an irregular heart rhythm or a heart murmur. Your veterinarian can easily diagnose an irregular heartbeat or murmur by simply listening to your dog’s heart. Depending on the severity of the condition, your Pitty may require further testing such as an echocardiogram and/or a chest x-ray and a treatment plan which could include diet control and medication. There is a small gland located close to the dog’s voice box in its neck called the thyroid gland. It is responsible for making a hormone called, ‘thyroxine,’ which controls the dog’s metabolism. When your pet has hypothyroidism, it means the thyroid gland is not producing enough of this hormone. The good news is, this condition is highly treatable with medication and is not usually life-threatening. This condition is characterized by a thickening and cloudiness to the lens of the eye. Cataracts can develop from disease, (such as diabetes), old age or trauma to the eye; however, most of the time it is a genetic disorder. Cataracts may be present at birth or develop when a dog is very young (between one and three years-of-age). Cataracts can lead to blurred vision, glaucoma or even blindness if left untreated. Do red and blue nose pit bull health conditions differ? 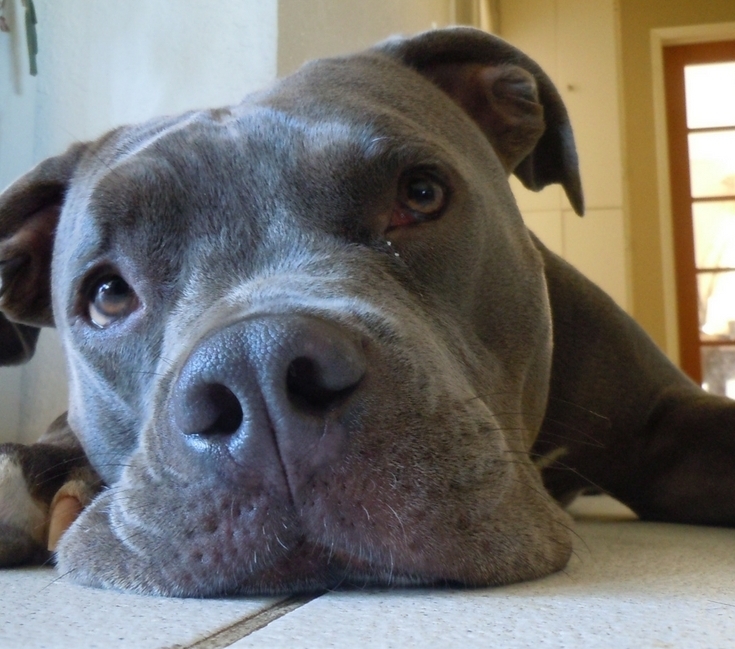 Check out “What is the Difference Between Blue Nose and Red Nose Pit Bulls?” to find out! Allergies are also one of the most common pit bull health issues, but thankfully it’s also among the easiest to treat on this list. Pitbull Skin allergies are typically caused by environmental allergens such as fleas, grass, pollen, and dust. However, allergies can also be caused by food, although this is less common is the Pit Bull. Typical food allergens include beef, rice, wheat, and corn. Even though allergies may be perceived as a “lesser” threat than the above conditions, they can still cause discomfort to your Pitty. Severe allergies can also lead to secondary infections which can develop into tissue damage if left untreated. To treat allergies, identifying and removing the cause from the dog’s environment can be all it takes. However, sometimes medications may also be prescribed to help alleviate the symptoms. These common health problems may seem scary. Get your Pit Bull regular check-ups with your veterinarian so he or she can watch for any signs of a genetic disorder. Catching an illness in its beginning stages is one way to ensure your Pittie’s long life. They say, “an ounce of prevention is worth a pound of cure.” This is especially true when it comes to the health and welfare of our fur babies. The Pit Bull, albeit a tough and rugged breed, is still no exception. Check out these best preventative methods to help keep the common pit bull health problems at bay. The Pit Bull is a muscular dog that has a high activity level. Plus, he’s a hearty eater. Being so, the Pittie needs a high quality, high protein diet that includes plenty of nutrients and vitamins. Be sure to research your dog food options by reading the side of the kibble bag for one that will meet your pet’s nutritional needs. Look for food that uses only identified meat sources (such as chicken, turkey, beef, etc.) with the minimal of fillers in the form of wheat, corn, soy, and animal by-products. Also note that Pit Bulls can be big moochers, accepting table scraps and human food any chance they get. Pittie pet parents should try to refrain from sharing their food as this breed is prone to obesity. Providing your pooch with a properly proportioned diet will also help prevent the onset of hip dysplasia and promote overall good health and longevity. Feeling overwhelmed by the ingredients on dog food bags? Learn how to demystify dog food labels! Running – the Pit Bull loves to run, and run, and run. Find a path, park or a quiet neighborhood to take your pooch for daily, moderately long runs. This not only gets out all those “zoomies” but it’s a fine way to keep both you and your Pit Bull’s muscle tone, as well as for weight management. Play Tug – Most dogs love a good game of tug, the Pittie is no exception. For this activity use a strong rope or stuffed toy – remember the Pit Bull is powerful so be sure your tug toy can withstand the pressure. Also when playing tug you will want to monitor your pooch’s intensity level so it doesn’t escalate into nipping or mouthing. Playful growling can also be expected and is normal for any breed of dog. Scent Walks – a dog’s smell is its number one sense so take him to a new area and let him follow his nose (as long as it’s not going to lead him into harm’s way or break any laws). Agility – if you love to teach your dog new skills, then why not try your hand and his paw at agility? This sport requires your dog to complete an obstacle course that consists of jumps, tunnels, weave poles, tires, balance beams, and more. It’s a fantastic way to not only give your pit bull the physical exercise he craves but also to mentally stimulate him as well. Flyball and Frisbee – another fun sport that many pet parents are engaging their dogs in is Flyball and Frisbee. Both of these require your dog to leap, jump, and run (which the Pittie loves to do). Fetch – sure, it may sound like a “basic” playtime activity, but engaging your pup in a game that allows him to chase a moving target, locate it, retrieve it, then return it to you, is the “cat’s meow,” (or at least a dog-gone good time). Plus, all you have to do is stand there! Winner, winner chicken dinner, works for me. 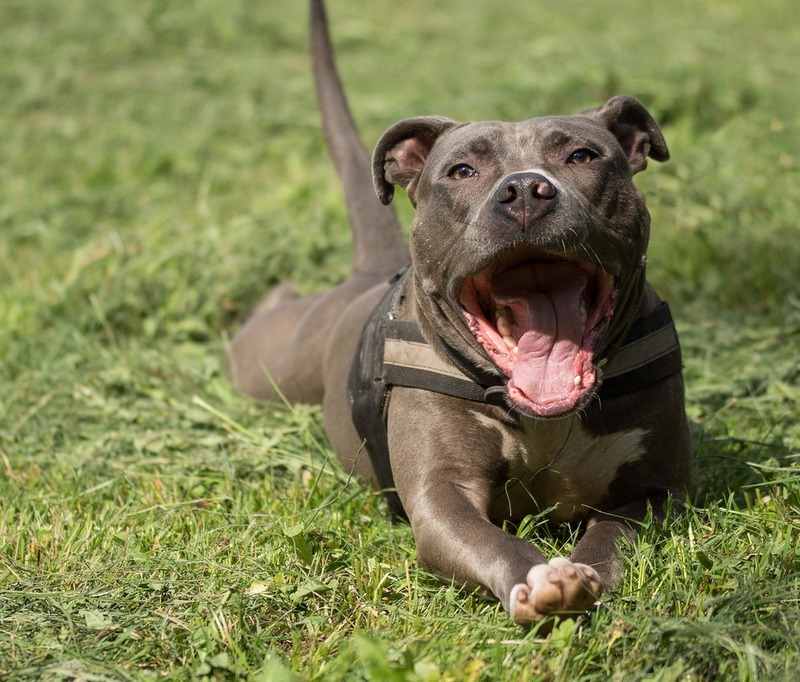 Check out these fun Games to Play with Your Pit Bull for even more great ideas! All puppies need early socialization. 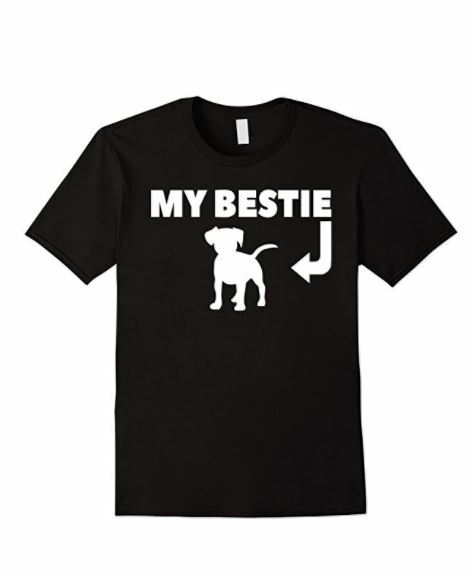 Socializing your Pit Bull is key to having a well-rounded and confident dog. This can be done through obedience classes, and playing in an area where there are other dogs and people, like a dog park. Allowing your Pittie puppy to meet new people and experience new places, all in a safe and controlled manner, will keep him from becoming timid and unruly as an adult. Like all purebreds, the Pit Bull does have some common health problems that can be linked to its genetic makeup. These include hip dysplasia, heart disease, hypothyroidism, cataracts, and allergies. However, with proper care like a high-quality diet, exercise, early socialization, and check-ups with your veterinarian, your Pittie can live a long and healthy life. If you are a Pit Parent and would like to share some tips on dealing with these common Pit Bull health problems or you have any questions we’d love to hear them. Just comment below!